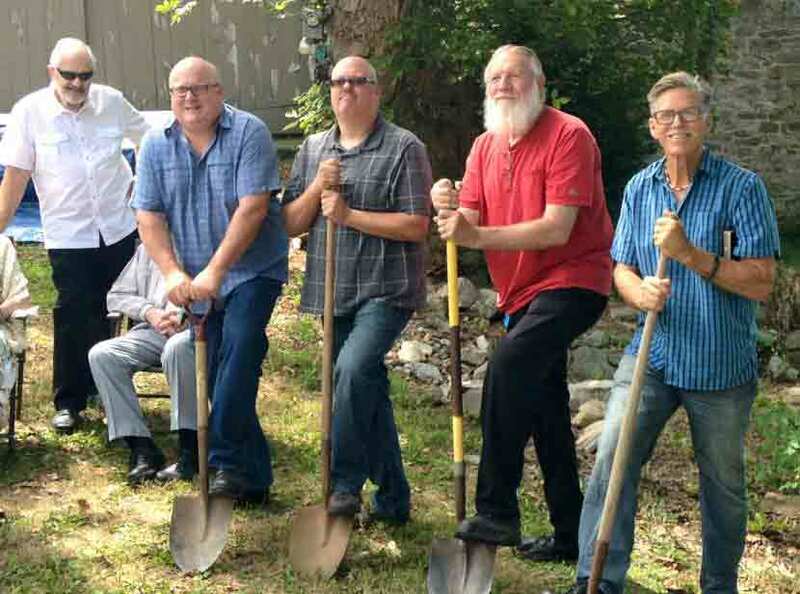 Helping break ground at Cornerstone Community Church is (with shovels, left to right) Kurt Nigh, Tim Keyser, Bill Smith, and Pastor Mike Richards. 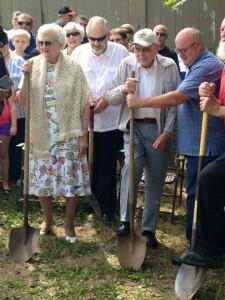 Looking on (in white shirt) is Larry Weber, former pastor of the Grace Brethren Church, Waynesboro, Pa., who represented the Mid-Atlantic District of Grace Brethren Churches. Cornerstone Community Church, a Grace Brethren congregation in Hagerstown, Md. 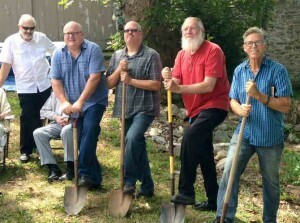 (Mike Richards, pastor), broke ground on Sunday at the site of their new facility, which is located at 20519 Beaver Creek Rd., Hagerstown. “We are rebuilding an 1811 stone and wood barn about 5 miles SE of Hagerstown,” says the pastor. “The stone can stay but all the wood will be replaced. It will still be a simple barn look with everything updated to code. We will have three rooms downstairs and a worship area that will hold about 250 people.” Work has already begun and they anticipate occupying the new facility in late fall. Fred and Bonnie Kuhn, members of the Cornerstone Community Church in Hagerstown, Md., help break ground for the new church facility. Until the building is ready, the church is meeting at 47 Crystal Falls Dr., Smithsburg, Md.